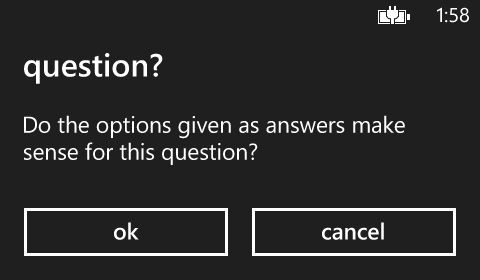 How many questions can be answered with either "ok" or "cancel"? I suspect you think very few. Yeah, me too. So why is it that so many apps ask questions and only give "ok" and "cancel" as possible answers? "cancel" is not the opposite of "ok"
If you are going to ask the person using the application and give them some options as answers, at the very least I'd expect those options to make sense and cover all eventualities. Having "MessageBox.Show()" in your code is almost always an indicator of a poorly designed interaction or notification and contributes to a poor user experience. Don't do it. ok? - or cancel?